Starting March 2019! Our Harriott II Dinner Cruise is a two hour cruise featuring a Southern Style dinner from our local chef, live entertainment and a full bar of quality beverages for purchase. This cruise is a great way to kick off your weekend, either with family or friends. Don't miss the boat! You can choose the dinner ticket option or the patio, ride only, option. 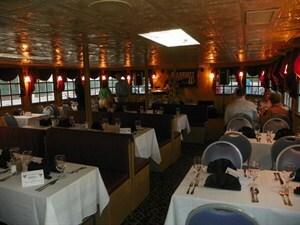 Dinner menu is listed below and offers reserved, inside seating, on 1st and 2nd decks. Patio seating is outside, general admission seating, and is first come first served on the 3rd exterior deck. Patio tickets do not come with a meal, but customers have access to out Paddle Wheel Grille and a cash bar for purchases. Add-On Packages do not include boarding tickets. Please purchase boarding tickets before purchasing an Add-On Package. Dinner Menu: March-May- Choice of Entree - Grilled Chicken Kabobs or Grilled Shrimp Kabobs, Garden Salad, Green Beans, Mashed Potatoes, Roll & Oreo Pie. June-Oct - Choice of Entree - BBQ Chicken Breast or Pork Tenderloin, Mashed Potatoes, Roasted Vegtable Medley, Roll & Cheesecake. **Vegetarian Pasta option available by request. All dinners include a non-alcoholic beverage (soda, coffee or tea).